The knee-jerk reaction to the Florida shooting, among jerks both with and without knees, was that we need more guns in schools. While we're on the subject of jerks, Secretary of Education Betsy DeVos thinks we need to have a robust conversation about them. Now Betsy DeVos is all about using schools to make her rich friends even richer. I don't imagine there are a whole lot of gun manufacturers moonlighting as cabdrivers, so why not help them out? DeVos had previously not made a big issue over the right to bear arms, focusing more on the threat of armed bears. But hey, whatever pulls money out of the pockets of working people and relocates it to those of people who least need it is good with DeVos and all her fellow Trumpies. The public argument goes like this--the only thing that stops a bad guy with a gun is a good guy with a gun. Like those who make such arguments, I've watched a lot of television. I have observed that good guys with guns tend to do better than bad guys with guns. This is true from 1950s westerns right up to the present day. 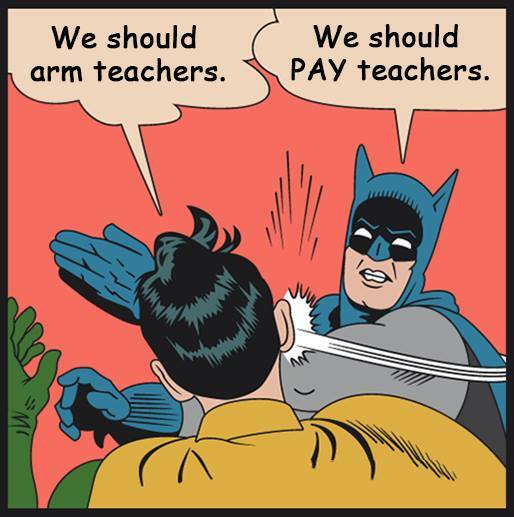 Here's the thing, though--while as a teacher I consider myself one of the good guys, I haven't got the remotest notion what to do with a gun. And even if I were trained how to use it, I have no idea how I'd react to a bad guy with a gun. Here's another fact--the fewer guns we have, the fewer people will be shot with them. Trump talks a big ball game about guns, at times even suggesting that "second amendment people" might take down Hillary Clinton. But when it comes his time to address the NRA, guns are not allowed. The Secret Service are expert in protecting the President, and they determined the best way to do so was to remove guns from the equation altogether. If that's the way to keep people safe, our kids ought to be kept safe in precisely the same manner. Where there are no guns, there is no one getting shot, not intentionally, not by accident, not at all. My home has no guns, and no gun accidents either. My house does have a dog, and we do have dog accidents now and then. Sometimes he pees on the floor and I clean it up. Sometimes I accidentally kick him if I don't see him. I pet him and apologize and he seems to understand. But no one goes to the hospital or dies. President Ronald Reagan was shot in 1981. He was surrounded by good guys with guns. In fact, as Secret Service, they were the best trained good guys with guns in the world. It certainly could have been worse, but even so it was unacceptable. Teachers can be taught about gun use, but we won't be the best trained good guys in the world, and hey, things on TV don't always reflect reality. Once the bad guys shoot the good guy with a gun, it's open season on said good guy's students. As if that weren't enough, there was an armed guard at the Florida high school where 17 people were murdered. The guard never saw the shooter. Here's how we deal with this--we stop selling assault weapons to Americans. These weapons should be the exclusive province of the military, and the people who offer them to others are criminals, whether or not the law says so. In Australia, they found a way to deal with mass shootings. They bought back a bunch of guns and made them unavailable. While that won't be perfect, it will at least curb the rampant availability of such weapons. We also need to close the gun show loophole that pretty much renders all state regulations moot. If I have to insure my car for liability, you damn well ought to have to insure your gun for the same. It's nice that Trump, who took 30 million dollars from the NRA, is now paying lip service to this issue. But we need a lot more than that. Bringing guns into classrooms is one of the very stupidest notions I've ever heard in my life. Related: Newt Gingrich states arming teachers is only long-term solution.